Gharana Mogudu is a step back in time to the Nineties, although it seems more like the Eighties considering the costumes and general shenanigans. 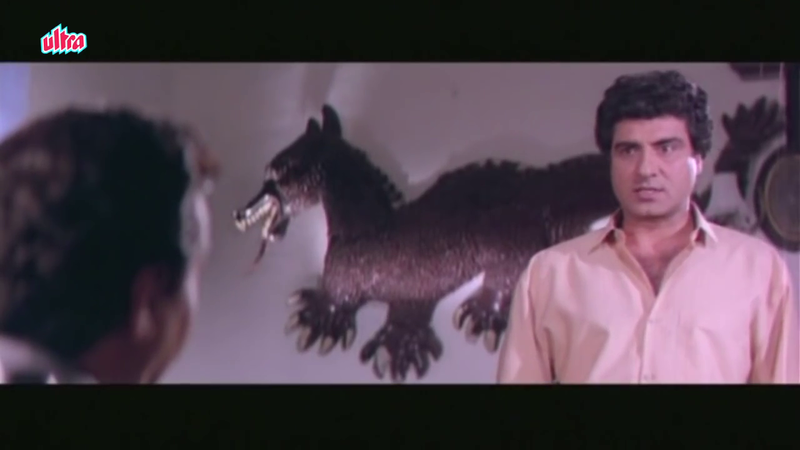 The songs deliver the costumes and as for general shenanigans, there is Uma Devi (Nagma) – a boss from hell who plots a marriage with her factory’s union leader to get her revenge for his popularity and force him to fall into line. Naturally since the union leader is Chiranjeevi, Uma Devi’s plans are never going to work out the way she wants, but there is a lot of entertainment in watching her attempts. 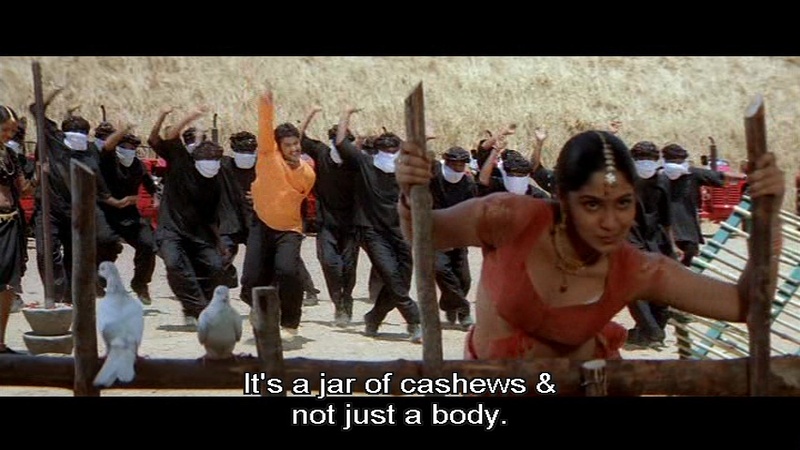 Nagma is wonderfully arrogant and egotistic in a role that lets her be as nasty as possible, but still look stunning as she efficiently crushes anyone who dares to oppose her management style. 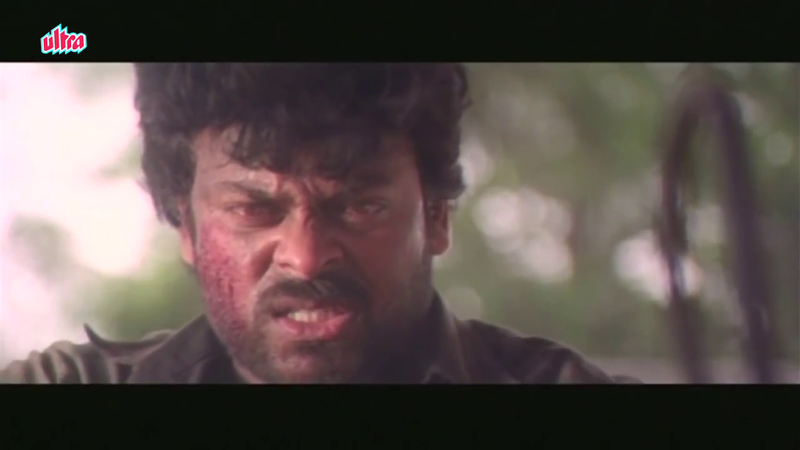 Chiranjeevi’s Raju is naturally the complete opposite, kind-hearted and generous, but just as stubborn and quite determined to stand up for his rights and those of his fellow workers. 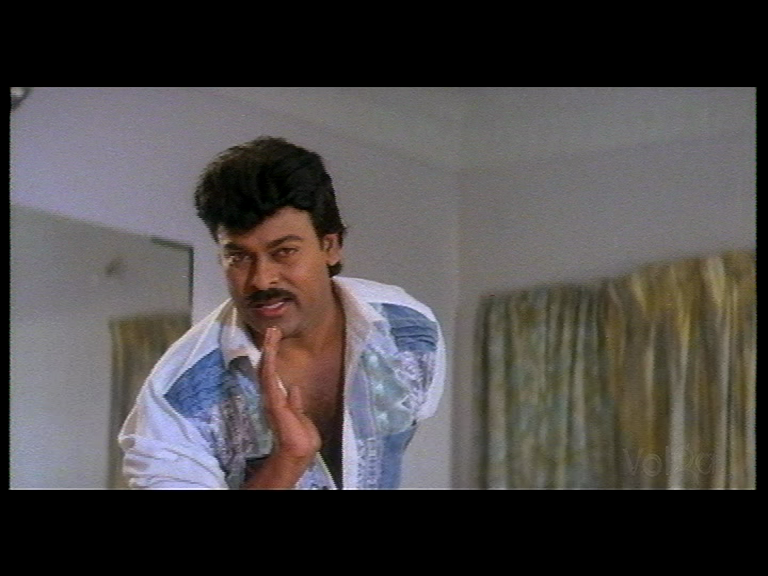 Of course he also dances up a storm and dishooms when and where required making Gharana Mogudu an excellent celebration of all things Megastar and perfect for this year’s Megabirthday celebrations. Before we can get to Uma Devi and her hazardous factory in Hyderabad, Raju is introduced as the dock worker to turn to in a crisis – even if that crisis is getting beaten up at an illegal fight betting ring. 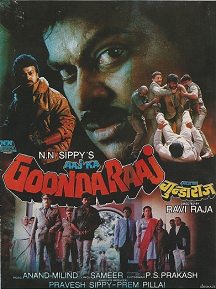 Naturally Raju wins the subsequent show-down but finds that the money he won has vanished – cue the excellent Bangaru Kodi Petta (which was remixed and re-imagined for Rajamouli’s awesome Magadheera ) with Disco Shanti running off with the betting money. 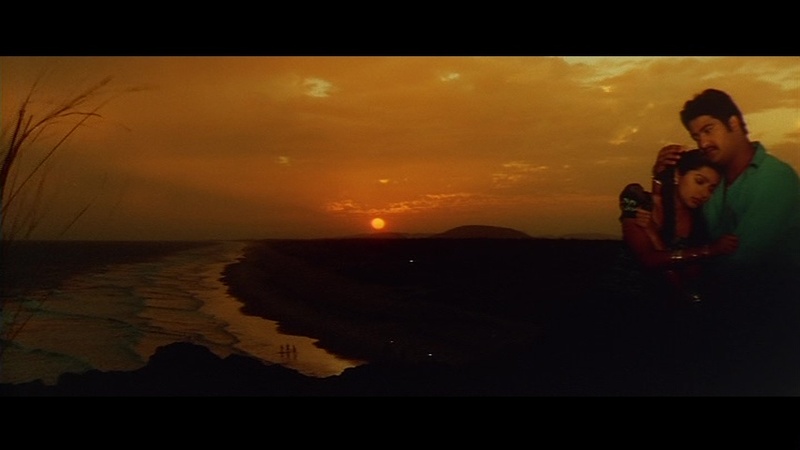 When his mother (Shubha) has a stroke, Raju leaves Vizag and the joys of waterfront employment and heads home to Hyderabad. 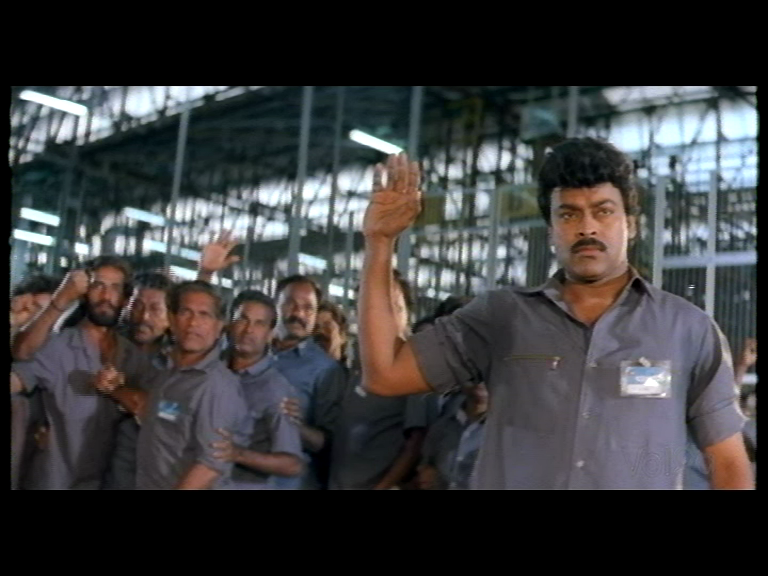 After arriving in the city, Raju fortuitously saves local businessman Bapineedu (Raogopal Rao), from a gang of thugs and as a reward is given the opportunity to work in his family factory. This sounds too good to be true, and of course it is, since Bapineedu and the family business are both actually run by his daughter – the boss from hell. Uma Devi has no interest in her workers except as a means to increase profit and make her the top tax payer in India (her ultimate ambition apparently). She has the union rep firmly under her thumb to ensure that there are no strikes despite her heavy handed treatment and is prone to petulant displays of temper if her will is crossed. I’m not sure if it’s one of her petty cruelties to make her secretary Bhavani (Vani Viswanath) wear such odd outfits to work but in her own time Bhavani looks much more appropriately dressed, so I have my suspicions, particularly when Uma Devi appears so co-ordinated. 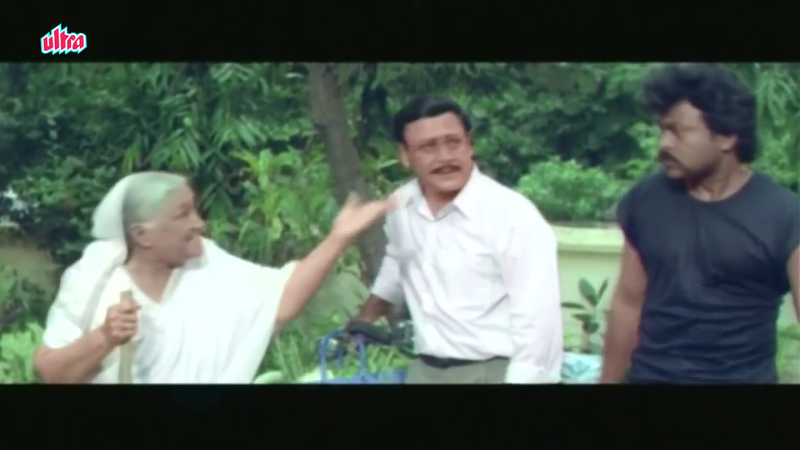 Uma Devi is just as bad at dealing with people on a personal level and the thugs who attacked her father were actually sent by Ranganayakulu (Kaikala Satyanarayana) after Uma Devi turned down a marriage proposal from his son (Sharat Saxena). 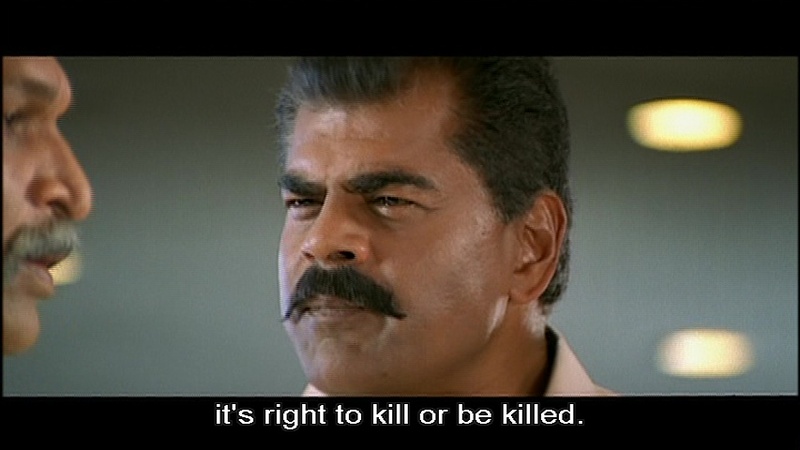 Ranganayakulu and his son are the main villains of the piece and while their response to a marriage refusal may seem a little over the top, to be fair Uma Devi is annoying enough that wiping her from the face of the planet doesn’t seem all that unreasonable. Uma Devi’s plan to marry Raju also disrupts the course of true love as Raju and Bhavani embark on an office romance after they meet each other on the way to work. 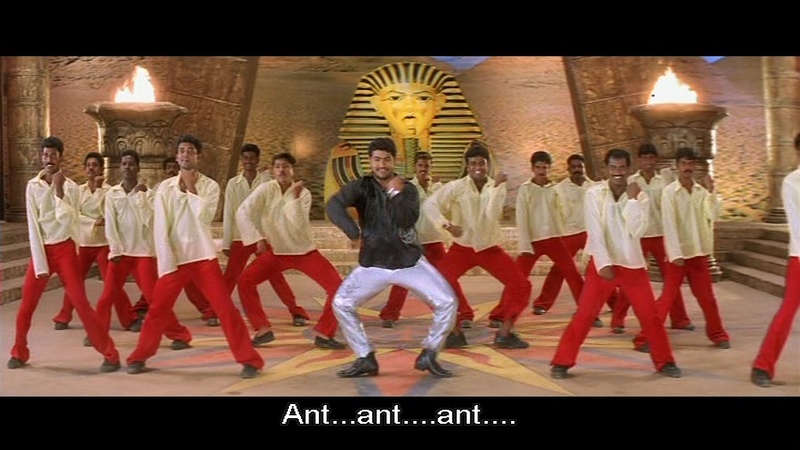 A bicycle ride in the rain leads to this excellent song, with Vani Viswanath keeping up with Chiranjeevi in the dance stakes despite his tendency to attack her with a bicycle – I really did want Bhavanai to dispose of Uma Devi and run away with Raju after this song! 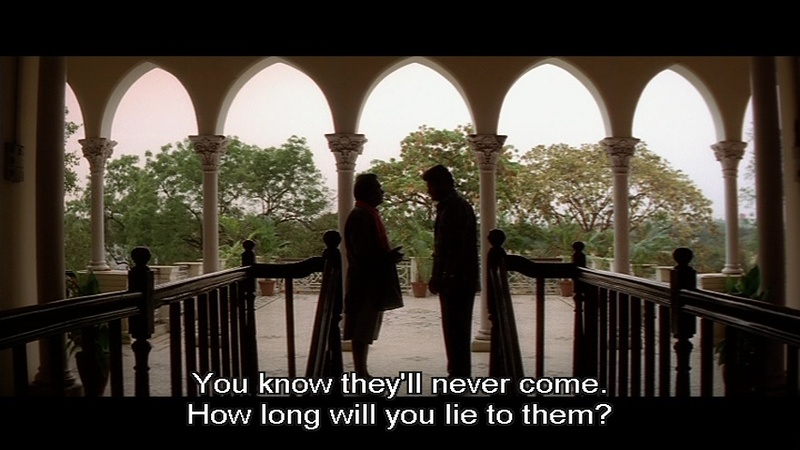 Sadly Bhavani is much too sweet to be a murderer, so Uma Devi goes ahead with her plan and Raju ends up moving into Bapineedu’s massive mansion with his new bride. The house is incredible, with statuary everywhere and a huge central imposing staircase, but none of that fazes Raju who continues to work on the shop floor and fight for workers’ rights. 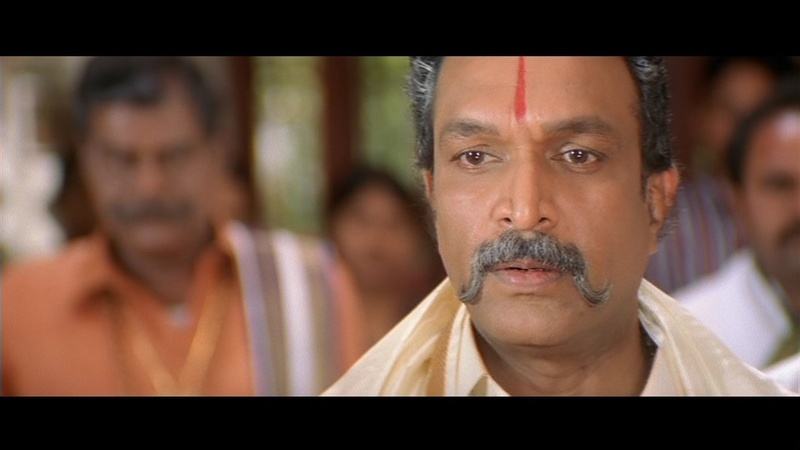 Now at this point you might think that Raju’s morals and basic decency might start to have an effect on Uma Devi and make her realise the error of her ways, but she’s still just as unpleasant as ever and it takes a drunken night and a lungi dance before she even begins to appear remotely bearable. Before then there are plenty of great confrontations between Uma Devi and Raju, shifty scheming from Ranganayakulu and Uma Devi’s manager Sarangapani (Ahuti Prasad) and plenty of those fantastic costumes to enjoy. 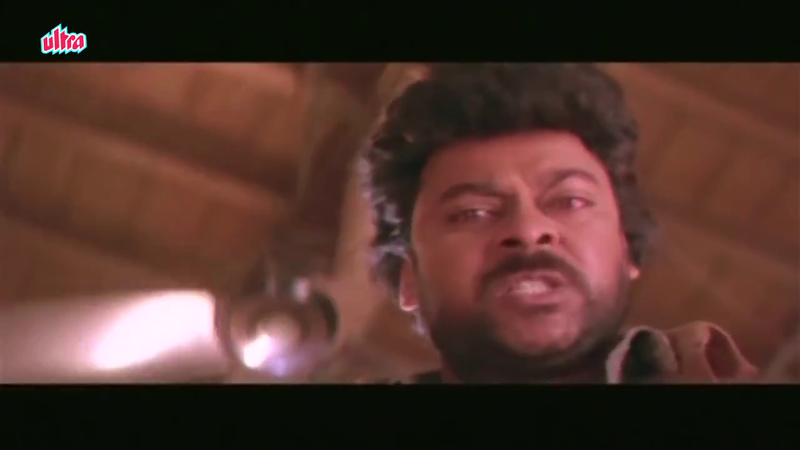 Chiru is dashing and very much the mega star as he mixes romance, compassion, ethical principles and his stance on workers’ rights with great dancing and action sequences. 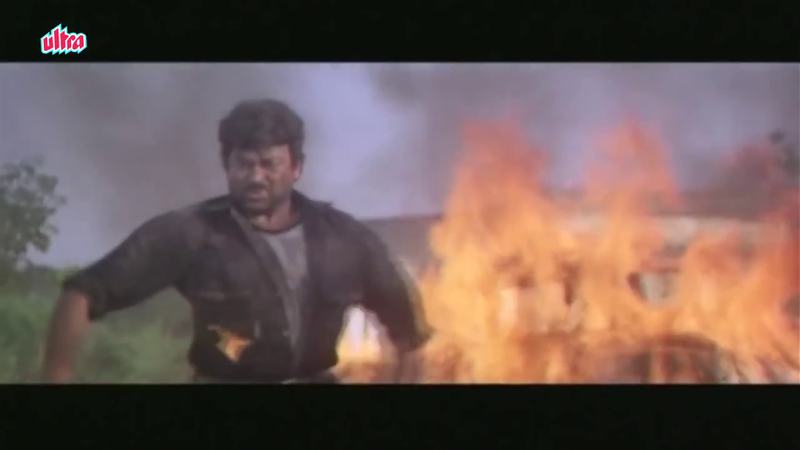 Pretty much everything gets mixed into the film and Chiranjeevi really is awesome no matter what he is doing! 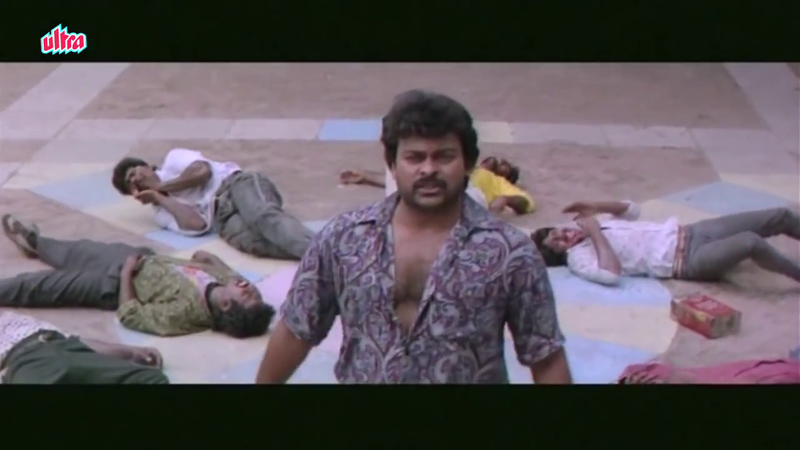 Nagma is delightfully vile and holds her own against Chiru keeping the focus of the film on Uma Devi and her machinations, while the plots of Ranganayakulu etc are totally overshadowed by her stormy relationship with Raju. She’s almost the classic Disney villainess and it seems obligatory to boo and hiss whenever she appears and naturally cheer for Chiranjeevi and Bhavani. Yes, even when watching on DVD in the comfort of your own living room. 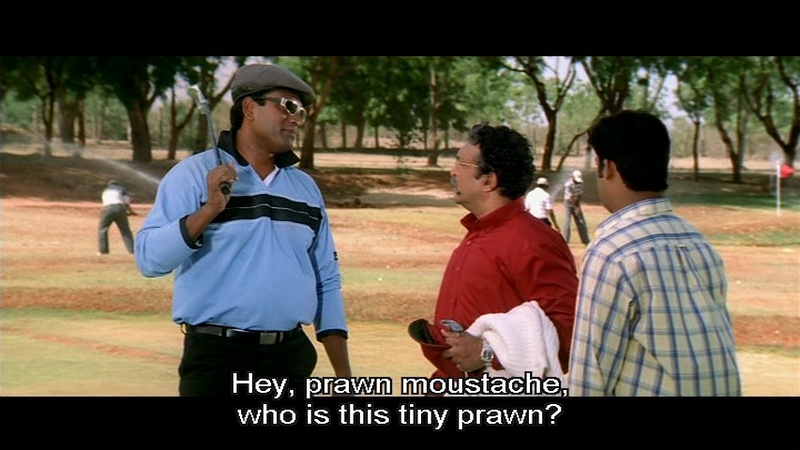 Along with all the drama there is room for some comedy too – Brahmi pops up but unfortunately makes little impression without the benefit of subtitles. 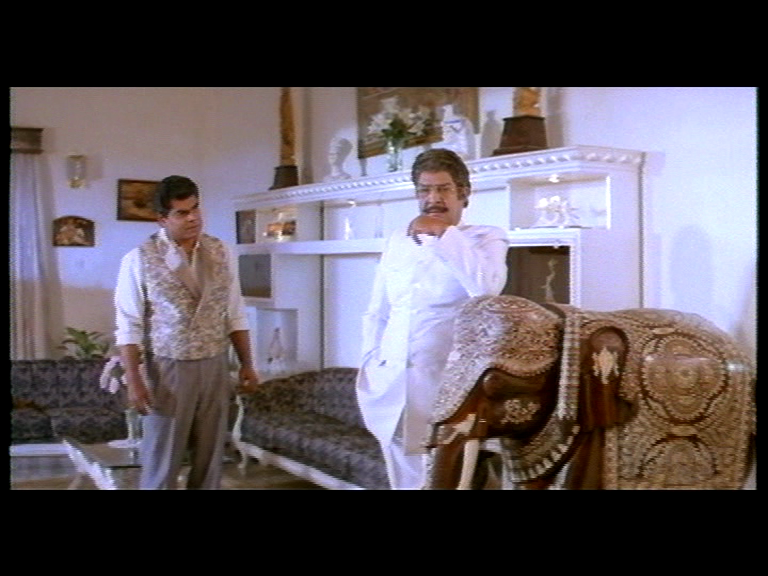 However the rest of the humour is based on interactions between Raju and the other characters, and being more situational comes across better. It’s a true masala film and although the plot is ridiculous and the characterisations over the top, Gharana Mogudu is still completely entertaining. Excellent performances, great songs and plenty of Megastar style make this definitely one to watch. 4 stars.